Photo by GoCobberBlog. Junior forward Tricia Sorenson scores one of her 20 points against St. Ben's on Jan. 21. The Concordia Women’s Basketball team is in the middle of the playoff hunt. The Cobbers (12-7 overall, 10-6 conference play) sit firmly entrenched in the top six, not an easy accomplishment having lost six graduating seniors from last year’s team. Those seniors included three of their top four scorers—48 percent of the team’s points. Though the team has played well so far, the close of the season won’t be easy with games left against the top three schools in the conference. The loss of that much experience was on the mind of some team members coming into this season. Returners have picked up the offensive load, with three players in the top 25 of the MIAC for scoring. 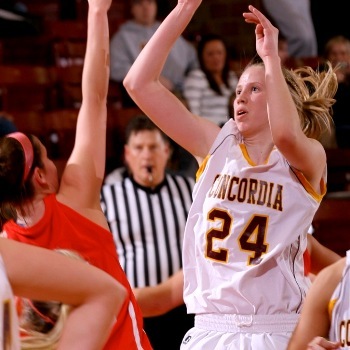 The Cobbers have also played defense, holding opponents to a conference second best 36 percent shooting. There are a few holes in the team’s game, including a 28 percent three point field goal percentage and a negative turnover margin. The inexperienced team has also taken some lumps over the course of the lengthy MIAC schedule. The Cobbers have posted a solid 4-4 record in conference road games but are a much better 5-2 at home. They will play four of their last six games at home. Closing out at home could be just what the Cobbers need to solidify a grasp on a playoff spot and the chance to host a first round game. The team’s expectations and goals for the rest of the year are a reflection of the process they’ve gone through this season. The right mentality to have for an “inexperienced” team.